We have seen that we use personality traits to help us understand and communicate about the people we know. But how do we know what traits people have? People don’t walk around with labels saying “I am generous” or “I am aggressive” on their foreheads. In some cases, thinking back to our discussions of reputation in Chapter 3, we may learn about a person indirectly, for instance, through the comments that other people make about that person. We also use the techniques of person perception to help us learn about people and their traits by observing them and interpreting their behaviors. If Zoe hits Joe, we might conclude that Zoe is aggressive. If Cejay leaves a big tip for the waitress, we might conclude that he is generous. It seems natural and reasonable to make such inferences because we can assume (often, but not always, correctly) that behavior is caused by personality. It is Zoe’s aggressiveness that causes her to hit, and it is Cejay’s generosity that led to his big tip. Although we can sometimes infer personality by observing behavior, this is not always the case. Remember that behavior is influenced by both our personal characteristics and the social context in which we find ourselves. What this means is that the behavior we observe other people engaging in might not always be reflective of their personality; instead, the behavior might have been caused more by the situation rather than by underlying person characteristics. Perhaps Zoe hit Joe not because she is really an aggressive person but because Joe insulted or provoked her first. And perhaps Cejay left a big tip in order to impress his friends rather than because he is truly generous. Because behavior can be influenced by both the person and the situation, we must attempt to determine which of these two causes actually more strongly determined the behavior. The process of trying to determine the causes of people’s behavior is known as causal attribution (Heider, 1958). Because we cannot see personality, we must work to infer it. When a couple we know breaks up, despite what seemed to be a match made in heaven, we are naturally curious. What could have caused the breakup? Was it something one of them said or did? Or perhaps stress from financial hardship was the culprit? It is easier to make personal attributions in some cases than in others. When a behavior is unusual or unexpected in the particular situation it occurs in, we can more easily make a personal attribution for it. Imagine that you go to a party and you are introduced to Tess. Tess shakes your hand and says, “Nice to meet you!” Can you readily conclude, on the basis of this behavior, that Tess is a friendly person? Probably not. Because the social context demands that people act in a friendly way (by shaking your hand and saying “Nice to meet you”), it is difficult to know whether Tess acted friendly because of the situation or because she is really friendly. Imagine, however, that instead of shaking your hand, Tess ignores you and walks away. In such cases, it is easier in this case to infer that Tess is unfriendly because her behavior is so contrary to what one would expect. To test this idea, Edward Jones and his colleagues (Jones, Davis, & Gergen, 1961) conducted a classic experiment in which participants viewed one of four different videotapes of a man who was applying for a job. For half the participants, the video indicated that the man was interviewing for a job as a submariner, a position that required close contact with many people over a long period of time. It was clear to the man being interviewed, as well as to the research participants, that to be a good submariner you should be extroverted (i.e., you should enjoy being around others). The other half of the participants saw a video in which the man was interviewing for a job as an astronaut, which involved (remember, this study was conducted in 1961) being in a small capsule, alone, for days on end. In this case, it was clear to everyone that in order to be good astronaut, you should have an introverted personality. During the videotape of the interview, a second variable was also manipulated. One half of the participants saw the man indicate that he was actually an introvert (he said things such as “I like to work on my own,” “I don’t go out much”), and the other half saw the man say that he was actually an extrovert (he said things such as “I would like to be a salesman,” “I always get ideas from others”). After viewing one of the four videotapes, participants were asked to indicate how introverted or extroverted they thought the applicant really was. As you can see in Table 5.2, “Attributions to Expected and Unexpected Behaviors,” when the applicant gave responses that better matched what was required by the job (i.e., for the submariner job, the applicant said he was an extrovert, and for the astronaut job, he said he was an introvert), the participants did not think his statements were as indicative of his underlying personality as they did when the applicant said the opposite of what was expected by the job (i.e., when the job required that he be extroverted but he said he was introverted, or vice versa). We are more likely to draw personal attributions when a behavior is unexpected. The numbers represent the percentage of extraverted responses that participants believed the job applicant would actually endorse if he were telling the complete truth. Participants were more likely to believe that the applicant was more extraverted (91%) and more introverted (45%) when he said that he did not have the personality traits required by the job than when he said that he did have the personality traits required by the job. Data are from Jones, Davis, and Gergen (1961). Jones, E. E., Davis, K. E., & Gergen, K. J. (1961). Role playing variations and their informational value for person perception. Journal of Abnormal and Social Psychology, 63(2), 302–310. The idea here is that the statements that were unusual or unexpected (on the basis of the job requirements) just seemed like they could not possibly have been caused by the situation, so the participants really thought that the interviewee was telling the truth. On the other hand, when the interviewee made statements that were consistent with what was required by the situation, it was more difficult to be sure that he was telling the truth (perhaps, thinking back to the discussion of strategic self-presentation in Chapter 3, he was just saying these things because he wanted to get the job), and the participants made weaker personal attributions for his behavior. We can also make personal attributions more easily when we know that the person had a choice in the behavior. If a man chooses to be friendly, even in situations in which he might not be, this probably means that he is friendly. But if we can determine that he’s been forced to be friendly, it’s more difficult to know. If, for example, you saw a man pointing a gun at another person, and then you saw that person give his watch and wallet to the gunman, you would probably not infer that the person was generous! Jones and Harris (1967) had student participants in a study read essays that had been written by other students. Half of the participants thought the students had chosen the essay topics, whereas the other half thought the students had been assigned the topics by their professor. The participants were more likely to make a personal attribution that the students really believed in the essay they were writing when they had chosen the topics rather than been assigned topics. Sometimes a person may try to lead others to make personal attributions for their behavior to make themselves seem more believable. For example, when a politician makes statements supporting a cause in front of an audience that does not agree with her position, she will be seen as more committed to her beliefs and may be more persuasive than if she gave the same argument in front of an audience known to support her views. Again, the idea is based on principles of attribution: if there is an obvious situational reason for making a statement (the audience supports the politician’s views), then the personal attribution (that the politician really believes what she is saying) is harder to make. So far, we have considered how we make personal attributions when we have only limited information; that is, behavior observed at only a single point in time—a man leaving a big tip at a restaurant, a man answering questions at a job interview, or a politician giving a speech. But the process of making attributions also occurs when we are able to observe a person’s behavior in more than one situation. Certainly, we can learn more about Cejay’s generosity if he gives a big tip in many different restaurants with many different people, and we can learn more about a politician’s beliefs by observing the kinds of speeches she gives to different audiences over time. When people have multiple sources of information about the behavior of a person, they can make attributions by assessing the relationship between a person’s behavior and the social context in which it occurs. One way of doing so is to use the covariation principle, which states that a given behavior is more likely to have been caused by the situation if that behavior covaries (or changes) across situations. Our job, then, is to study the patterns of a person’s behavior across different situations in order to help us to draw inferences about the causes of that behavior (Jones et al., 1987; Kelley, 1967). Research has found that people focus on three kinds of covariation information when they are observing the behavior of others (Cheng & Novick, 1990). Consistency information. A situation seems to be the cause of a behavior if the situation always produces the behavior in the target. For instance, if I always start to cry at weddings, then it seems as if the wedding is the cause of my crying. Distinctiveness information. A situation seems to be the cause of a behavior if the behavior occurs when the situation is present but not when it is not present. For instance, if I only cry at weddings but not at any other time, then it seems as if the wedding is the cause of my crying. Consensus information. A situation seems to be the cause of a behavior if the situation creates the same behavior in most people. For instance, if many people cry at weddings, then it seems as if the wedding is the cause of my (and the other people’s) crying. Imagine that your friend Jane likes to go out with a lot of different men, and you have observed her behavior with each of these men over time. One night she goes to a party with Ravi, where you observe something unusual. Although Jane has come to the party with Ravi, she completely ignores him all night. She dances with some other men, and in the end she leaves the party with someone else. This is the kind of situation that might make you wonder about the cause of Jane’s behavior (is she a rude person, or is this behavior caused more by Ravi?) and for which you might use the covariation principle to attempt to draw some conclusions. According to the covariation principle, you should be able to determine the cause of Jane’s behavior by considering the three types of covariation information: consistency, distinctiveness, and consensus. One question you might ask is whether Jane always treats Ravi this way when she goes out with him. If the answer is yes, then you have some consistency information: the perception that a situation always produces the same behavior in a person. If you have noticed that Jane ignores Ravi more than she ignores the other men she dates, then you also have distinctiveness information: the perception that a behavior occurs when the situation is present but not when it is not present. Finally, you might look for consensus information: the perception that a situation is creating the same response in most people—do other people tend to treat Ravi in the same way? An external attribution (to the situation, in this case the TV show) is more likely if… All my friends laugh at this TV show. Bill laughs more at this TV show. Bill always laughs at this TV show. An internal attribution (to the person, in this case Bill) is more likely if… Very few of my friends laugh at this TV show. Bill laughs at this TV show as much as he laughs at other TV shows. Bill always laughs at this TV show. According to the covariation principle, we use three sources of information to help us determine whether we should make an attribution to the situation or to the person. In this example, the attribution is either personal (to my friend Bill) or situational (to a TV show we are watching). In summary, covariation models predict that we will most likely make external attributions when consensus, distinctiveness, and consistency are all high. In contrast, when consensus and disctinctiveness are both low and this is accompanied by high consistency, then we are most likely to arrive at an internal attribution (Kelley, 1967). In other situations, where the pattern of consensus, consistency, and distinctiveness does not fall into one of these two options, it is predicted that we will tend to make attributions to both the person and the situation. These predictions have generally been supported in studies of attribution, typically asking people to make attributions about a stranger’s behaviors in vignettes (Kassin, 1979). In studies in more naturalistic contexts, for example those we make about ourselves and others who we know well, many other factors will also affect the types of attributions that we make. These include our relationship to the person and our prior beliefs. For instance, our attributions toward our friends are often more favorable than those we make toward strangers (Campbell, Sedikides, Reeder, & Elliot, 2000). Also, in line with our discussions of schemas and social cogniton in Chapter 2, they are often consistent with the content of the schemas that are salient to us at the time (Lyon, Startup, & Bentall, 1999). Causal attribution is involved in many important situations in our lives; for example, when we attempt to determine why we or others have succeeded or failed at a task. Think back for a moment to a test that you took, or another task that you performed, and consider why you did either well or poorly on it. Then see if your thoughts reflect what Bernard Weiner (1985) considered to be the important factors in this regard. Weiner was interested in how we determine the causes of success or failure because he felt that this information was particularly important for us: accurately determining why we have succeeded or failed will help us see which tasks we are good at already and which we need to work on in order to improve. Weiner proposed that we make these determinations by engaging in causal attribution and that the outcomes of our decision-making process were attributions made either to the person (“I succeeded/failed because of my own personal characteristics”) or to the situation (“I succeeded/failed because of something about the situation”). 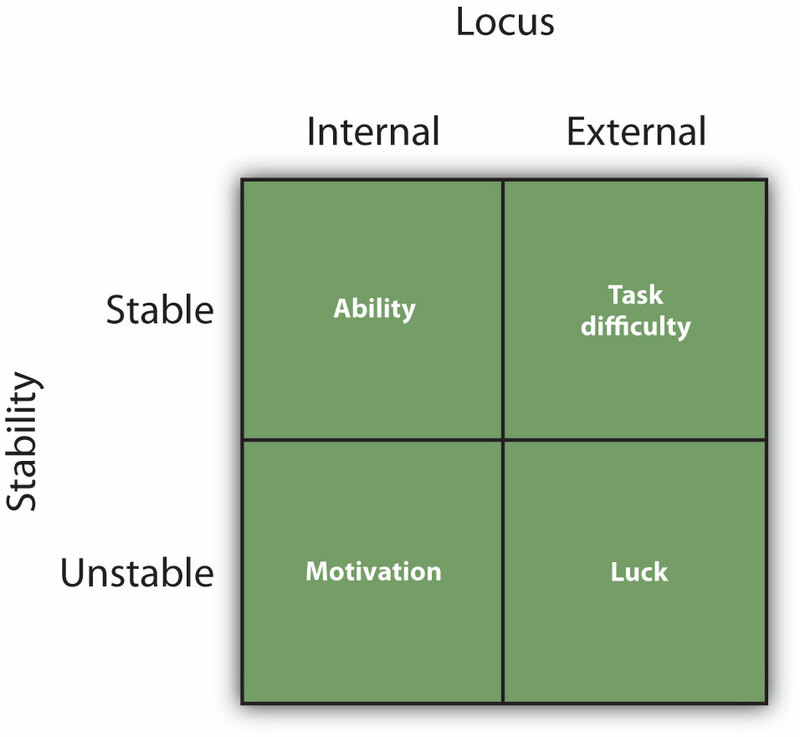 Weiner’s analysis is shown in Figure 5.8, “Attributions for Success and Failure.” According to Weiner, success or failure can be seen as coming from personal causes (e.g., ability, motivation) or from situational causes (e.g., luck, task difficulty). However, he also argued that those personal and situational causes could be either stable (less likely to change over time) or unstable (more likely to change over time). This figure shows the potential attributions that we can make for our, or for other people’s, success or failure. Locus considers whether the attributions are to the person or to the situation, and stability considers whether or not the situation is likely to remain the same over time. If you did well on a test because you are really smart, then this is a personal and stable attribution of ability. It’s clearly something that is caused by you personally, and it is also quite a stable cause—you are smart today, and you’ll probably be smart in the future. However, if you succeeded more because you studied hard, then this is a success due to motivation. It is again personal (you studied), but it is also potentially unstable (although you studied really hard for this test, you might not work so hard for the next one). Weiner considered task difficulty to be a situational cause: you may have succeeded on the test because it was easy, and he assumed that the next test would probably be easy for you too (i.e., that the task, whatever it is, is always either hard or easy). Finally, Weiner considered success due to luck (you just guessed a lot of the answers correctly) to be a situational cause, but one that was more unstable than task difficulty. It turns out that although Weiner’s attributions do not always fit perfectly (e.g., task difficulty may sometimes change over time and thus be at least somewhat unstable), the four types of information pretty well capture the types of attributions that people make for success and failure. We have reviewed some of the important theory and research into how we make attributions. Another important question, that we will now turn to, is how accurately we attribute the causes of behavior. It is one thing to believe that that someone shouted at us because he or she has an aggressive personality, but quite another to prove that the situation, including our own behavior, was not the more important cause! Causal attribution is the process of trying to determine the causes of people’s behavior. Attributions are made to personal or situational causes. It is easier to make personal attributions when a behavior is unusual or unexpected and when people are perceived to have chosen to engage in it. The covariation principle proposes that we use consistency information, distinctiveness information, and consensus information to draw inferences about the causes of behaviors. 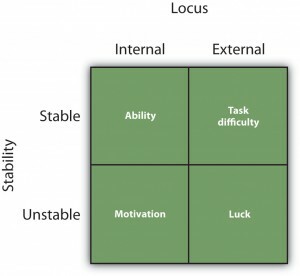 According to Bernard Weiner, success or failure can be seen as coming from either personal causes (ability and motivation) or situational causes (luck and task difficulty). Describe a time when you used causal attribution to make an inference about another person’s personality. What was the outcome of the attributional process? To what extent do you think that the attribution was accurate? Why? Outline a situation where you used consensus, consistency, and distinctiveness information to make an attribution about someone’s behavior. How well does the covariation principle explain the type of attribution (internal or external) that you made? Consider a time when you made an attribution about your own success or failure. How did your analysis of the situation relate to Weiner’s ideas about these processes? How did you feel about yourself after making this attribution and why? Allison, S. T., & Messick, D. M. (1985b). The group attribution error. Journal of Experimental Social Psychology, 21(6), 563-579. Campbell, W. K., Sedikides, C., Reeder, G. D., & Elliot, A. J. (2000). Among friends: An examination of friendship and the self-serving bias. British Journal of Social Psychology, 39, 229-239. Cheng, P. W., & Novick, L. R. (1990). A probabilistic contrast model of causal induction. Journal of Personality and Social Psychology, 58(4), 545–567. Heider, F. (1958). The psychology of interpersonal relations. Hillsdale, NJ: Lawrence Erlbaum. Jones, E. E., & Harris, V. A. (1967). The attribution of attitudes. Journal of Experimental Social Psychology, 3(1), 1–24. Jones, E. E., Davis, K. E., & Gergen, K. J. (1961). Role playing variations and their informational value for person perception. Journal of Abnormal and Social Psychology, 63(2), 302–310. Jones, E. E., Kanouse, D. E., Kelley, H. H., Nisbett, R. E., Valins, S., & Weiner, B. (Eds.). (1987). Attribution: Perceiving the causes of behavior. Hillsdale, NJ: Lawrence Erlbaum. and Social Psychology, 37, 1966-1981. Kelley, H. H. (1967). Attribution theory in social psychology. In D. Levine (Ed. ), Nebraska symposium on motivation (Vol. 15, pp. 192–240). Lincoln, NE: University of Nebraska Press. Weiner, B. (1985). Attributional theory of achievement motivation and emotion. Psychological Review, 92, 548–573. Inferring Dispositions Using Causal Attribution by Dr. Rajiv Jhangiani and Dr. Hammond Tarry is licensed under a Creative Commons Attribution-NonCommercial-ShareAlike 4.0 International License, except where otherwise noted.